If you’ve been in business, especially on the freelance/consulting side, you’ve likely been burned before by a non-paying client. If not, count your lucky stars, as the odds are that you will end up with unpaid invoices at some point in your not-so-distant future. It’s not fun, but it’s part of doing business. The following 18 tips combine to create a road to reimbursement, with each item making up an important step down your payment pathway. Of course, taking on the right clients is one of the most critical things that you can do. Always trust your intuition. If something seems awry, it very well may be. If a client doesn’t seem like the right fit coming into a project, take note. If you can fiscally stay away, that may be your best option. If you can’t refuse the job, these tips may help you mitigate losses. One of the keys to getting paid on time and on schedule is by putting yourself in an ideal position. This section will help you properly set up a project, keep some cards in your pocket and ensure that you’ll leave yourself some options if confronted with a non-payment down the road. 1) Don’t Deliver Until Fully Paid! The first rule of doing any type of business is to understand who has the upper hand. In an ideal world, the consultant/client relationship will be fairly even. Your client shouldn’t pay you 100% of a project ahead of time, nor should you deliver a project in full until you are paid. As soon as you deliver the project in full, you have lost all of your leverage. To cover your bases, get as close to delivering a finalized project while still holding the trump card. If you haven’t been paid in full, send designs with a watermark, don’t hand over source code, give low-resolution files, etc. But, seeing that you landed here and are reading this article, there’s a good chance that you’ve already delivered the full project and this isn’t an option. In this scenario, the worst outcome for you, the contractor, would be that you don’t get paid for one stage that you worked on. The worst outcome for your client would be a failed delivery on a stage and they would be out one payment. Due to the fact that this method minimizes loss on both sides of the table, most clients are receptive, if not ecstatic about this method. That it will clearly define the project (you can reference the approval of a more defined Statement of Work in upcoming additional phases), so if you need to go to court you will have proof that each party did in fact enter an agreement. That it will be acceptable to both parties. You don’t want to send over a ridiculously one-sided document that will scare your client away. The goal is to get your invoices paid – something that can be tough to do if you don’t have any clients. When creating a contract, you can hire a lawyer or look to existing templates. Lawyers typically provide better contracts at a higher price. Templates typically come at a fraction of the price, but aren’t customized to your needs and regulations. Using cookie-cutter documents can be tricky, so if you can have a custom contract created, that would be the safest route. Pro Tip: If you buy a contract template to start with, and modify it to add basic project, state and county regulations, you may be able to save significant money by having a lawyer review it, instead of drafting a contract from scratch! Sometimes you may not use a contract, and are instead on a retainer for projects. Even in this case, we recommend getting sign-off or approval on all work. This small step will cure you from large headaches down the road. The best way to do this is to send a simple invoice that can be approved digitally or on paper. Whether a simple document, an email asking for approval, or a proper estimate, this step shows that they did in-fact approve the project. While this is an extra step, many invoicing systems (like Bill Flight) can instantly turn an approval estimate directly into an invoice and will actually save you a step. It is fairly safe to say that the words “Gee golly, I sure enjoy time tracking!” have never been uttered. Yet many folks likely have praised their commitment to tracking time when their work was questioned. Having detailed, meticulous records of what was worked on and when can help you make your case if you ever end up taking someone to court. There are handfuls of time tracking apps on the market today that can detail the work, when it occurred, and who performed it. Many invoicing apps (like Bill Flight) have time tracking features built right in, and can actually save time by adding efforts directly into an invoice! The reason that this matters is that you can accurately track hours and effort on projects down to the minute. You’ll then have this data ready to be dispensed without having to circle back and retrace your footsteps as to who was working on a project and when they put forth the effort. (You’ll see more about this in some of the following tips). Oh hello there, intuition! What’s that you say? Yeah, I’m with you, something seems odd with these guys. Let’s tread carefully here. If you are at this point in the process, you’ve probably seen signs that trouble you. These signals may or may not be egregious, but should be observed and noted. As the great RZA once said, “You best protect your neck.” This is officially neck protection time. Phone calls or in-person meetings are far and away the best forms of communication, but they don’t leave a trail. When you start thinking that the relationship is deteriorating, or that a payment won’t come, follow up with everything using email, text, or documentation (revised estimates, scanned change orders, etc.). This will ensure that you will have a record of the matter at hand and will have documentation that will back you up. Thanks for taking the time to talk yesterday. We are very excited to finish up the Widget project on time, but I wanted to quickly confirm one thing with you directly. We will be manufacturing 100 blue widgets, but I’d like to confirm the delivery date for the widgets. I have in my notes that the date is the 1st, but I wanted to make sure as we aren’t going to let this slip through the cracks. I’ve also attached the final invoice so we won’t have any delays with the accounts payable team. This email simply confirms a fact (that you may have already known) but gives you documentation on the off-site conversation. Pro Tip: There are services that notify you when an email is opened with the time and date. This will help you record when emails were viewed and if they were opened. These don’t work across the board and aren’t 100% accurate, but can keep you in the know when your messages have been read. If you’ve made it to this point, you’ve likely identified a pattern: details and paper trails. This continues on into the invoicing and payment process. When doling out invoices, take your time and describe what they are for, that it is for the “x payment” of “y payments” due and use line items to describe everything that has occurred during the span of this invoice. This way, customers know where they stand when it comes to project payments and what the current progress is. Make sure that checks are made out and include the invoice number so there are no questions on what the payment was for. Your client should indicate the invoice number on the “for” line of the check and if left blank, follow up with an email to confirm that Check # is in fact for Invoice #. This will help to make it clear that the client knew the full details, scope, and status of the project. When an invoice becomes overdue, it needs to be known by the client – and the sooner the better. As soon as you see an invoice go from open to overdue, it’s time to move. A digital paper trail showing that they did receive the email and invoice. The knowledge that they did in fact receive the invoice. Most invoicing solutions take the proper measures to make sure they are whitelisted, but it is possible that an email from your system doesn’t make it into their inbox. Sending the invoice from your own tried and true address that you use to communicate with them daily will give you the knowledge that this isn’t a mistake. When sending the email, it is important to know that there may in fact be a mistake in payment. Your contact may not know they were behind, the new accounts payment team may have changed, a check may have been lost in mail…so on and so forth. Be cordial and ask if there is someone else who should be getting invoices, and for an updated email. The goal of this is simple: to make sure your client in fact has the invoice, that they acknowledge they owe and understand the bill, and that you have a record that you contacted them. Hopefully the resolution is quick and just. As soon as an invoice becomes overdue (and you know that it purposefully hasn’t been paid), it may be time to offer other methods that may help you get your money. The key is to make it easy on your client and to get payment as quickly as possible. This means that if you have only accepted checks, you may want to branch out. Some invoicing solutions (*cough*, *cough*) offer the ability to collect credit cards online without upgrading your service. You’ll likely end up losing a taste out of the full invoice entre – but it will be significantly less than court fees. For example, Bill Flight integrates with Stripe at no extra cost. Stripe has clear cut pricing that takes 2.9% of the total bill along with a 30 cent fee. It’s a small price to pay for your money currently sitting in arrears. So why credit cards? The answer is partially a selfish one and partially a lazy one. First, most credit cards have significant rewards packages associated with them. A client who is waffling on whether or not to make a payment may get the needed nudge knowing that they’ll get a flight upgrade in the process. The other incentive with credit cards for payment is that they are nearly instant. Your client doesn’t need to haul out a checkbook, label an envelope, find a check and mosey on down to the post office; they can just break out their wallet and be on their way. Other options that you can ask your client about are PayPal, Square Cash, Venmo, or if you have a merchant account, you can call the client up and manually enter the payment in that way. Whatever it takes. Sometimes, when you are looking down the barrel of a non-payment, you need to adjust accordingly – even if it costs you a few bucks along the way. In today’s digital ecosphere, we often overlook traditional options. Sometimes, seeing a physical document with a big red “Overdue” stamp on it can put an accounts payable team into a tizzy. You may be surprised at how effective this simple strategy can be. Pro Tip: If you’ve already sent a physical piece of mail out to your client’s name, send one directly to “Accounts Payable”. It is the job of these folks to pay invoices and many times they do so to a fault. One year Citi paid more than $400 million fake invoices. At this point, we are fairly certain that we are looking at an egregious non-payment of an invoice. You’ll want to start leveraging every resource you can with your client and prepare for a legal battle. We can use some of this preparation to help coax out a check, but the odds of these tactics working will likely have low percentages, and won’t cost you anything but your time. If you are dealing with a larger company and not just a partnership/proprietorship, you may want to bring other folks into the mix that you’ve worked with. If you’ve delivered portions of the project to a specific team member, send them an email asking them if they’ve been satisfied with the work, if there is anything else required, and see if there is anything they can do to push payment to keep things on track. Not paying an invoice that is due is embarrassing. Having co-workers bring it up should only increase this shame. Even if the additional contacts can’t pay, they could help you down the road by building a case for you. This leads us nicely into our next tip…. Once you know that a payment has deliberately gone unpaid, it’s time to start getting your detail ducks in a row. Your memory isn’t as fantastic as you think, and the only better day to document these interactions was yesterday. Grab a cozy seat and relax – you may be there for a while. In this step, it is important to note all of the interactions that you’ve had with this client in a meticulous manner. Hopefully you paid attention to the time tracking tip and have most of the work done for you. If not, note dates that you had meetings, when you got approvals, which emails need to be starred and saved, and create your own timeline of interactions with supporting documentation. You should now have a detailed view of the project as a whole with all documents that matter. Don’t leave anything out. The goal of this step isn’t to make you look good – it is to see the full, unbiased picture of the project. You can then use this down the road to help get payment or win a court case. Now that you have a timeline of what’s happened, we’ll use it to try to push for a payment. We’ll want to recap the important bits and let the client see why you deserve the payment. In this step, it isn’t likely that the client made a mistake, but they still may have forgotten certain things that happened – like an approved SOW, the signed scope increase by an underling, or an extra revision request. Take a look at the ledger and select the major, most important items from the list and create a mini ledger. This should then be sent to your client along with a rationale about why the project goals have been fulfilled, and that payment should be submitted. Be respectful but firm on the fact that your list accurately chronicles the project and points out when you submitted the deliverables required for payment based on the initial proposal or quote agreed upon. Pro Tip: Don’t include the kitchen sink when you send them this email. You want to document the main points, but not show your entire hand. You don’t need to attach emails or all detail on interactions. We want to give them enough to pay – not to come up with a defense strategy. You’ve sent physical mail, you’ve emailed everyone that you could, and you still aren’t getting paid. It’s time to step it up and use a stronger approach. Remember one thing during all of this – you are a professional – act like one. There is no need to slander, lie or do anything illegal. Hopefully you’ve built up a case and your hand has simply been forced here. Something that you may not know is that many collections companies don’t charge a dime unless they get paid. Many charge quite a bit, though. A rough estimate that the agency will take is between 25% and 50% of the total amount owed. This is the reason that we didn’t balk at that 2.9% credit card fee earlier. Sometimes you put yourself in a position where any payment is a win. Even if you bring in 75% of your invoice here, that may be a big win compared to what lawyer fees run. You’ll want the invoice to be 90 to 120 days past due before bringing them on, and also make sure that you are positive that the client is actually trying to stiff you (hopefully you know by this point). Do some research and talk to a collections company about recouping the money owed to you. Most of these agencies will put in a good bit of effort at the beginning, and may actually scare the client into paying you. They’ll share call records with you and a status on what the client is saying. Once they start getting shutout and see that they aren’t going to make any money, they typically lose interest and you’ll be out of hope. The keyword here is professional. Remember that. If you take this step, your actions should be professional, not punitive. Reviews are made to leave feedback for a company, whether good, bad or indifferent. In this case, you haven’t been paid for something you agreed upon and others should know of this negative. Leave a review that chronicles your experience with the company, but go out of your way to make it fair and not an attack. Seeing a professional, well-stated and documented, non-petty negative review appear alongside your company is a horrific feeling. Many times, the visibility and exposure that a review carries is more expensive than just paying a bill. Some locations that have reviews prominently displayed are Google, Yelp and Foursquare. If you execute this step with civility and facts, you may find that the client will reach out to you and admit mistake and offer payment, though it is not likely. Pro Tip: Proceed with caution. If your client is nuts, this can spur a review war. You may end up doing more harm than good if they leave you a bad review as well. Most sites have options to have reviews reviewed (say that fast 5 times), but others, like Google, don’t have any support. “What complaints do we handle? The definition of a product is a good or service. If they failed in service to you, it should be known. Again, to resolve and remove the complaint, a company may choose to pay instead of having it on their public record. Yes, it has come to this. Every nugget of advice was previously given in order to stay out of this scenario. But alas, we are here. If the amount owed is worth it, look at your options for going to court. In all likelihood, you’ll want a lawyer for small claims or civil court cases and the costs may add up quick. We strongly advise that you contact a legal professional and find out what your best options are. Thankfully, you’ve done most of the legwork by now and have great documentation, paper trails and evidence that should save you some time and money. Good luck – may Lady Justice serve you well. When life gives you lemons, sometimes you just have to keep them. If you don’t want to go to court, can’t get the money back and are out of luck, – use this as a learning experience. Remember – you chose to work with this client, you delivered the full project without payment, and you were the one that didn’t have a rock solid contract. The easiest thing in the world is to shift blame and point fingers. Don’t do that. Own this and be better next time. Take this loss and apply it towards other projects moving forward. Don’t let yourself lose leverage in the future, don’t buy into people’s excuses the next time, whatever it may be. Find something important that can change the way you work moving forward and use it as a teachable moment – a costly yet valuable moment at that. 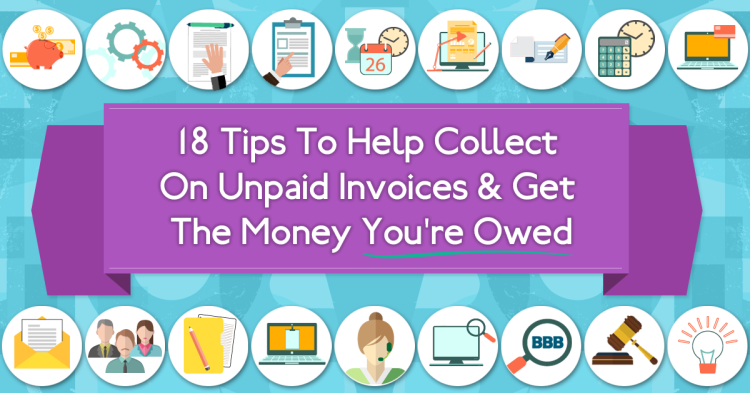 And there you have it – our 18 tips and tactics to getting your overdue invoices paid. If you are still reading this, we hope that you have collected those debts and have built a foundation that will keep you hassle-free and paid-in-full throughout the years to come. Now to a shameless plug. We built Bill Flight with many of these features in mind – time tracking, estimates, credit card integration, easy reporting, etc. With an absolutely free account option and no credit cards required, we’d love for you to let us help keep you paid-in-full for the years to come.